Worcestershire sauce (), sometimes shortened to Worcester sauce (), is a fermented liquid condiment. It is often an ingredient in Welsh rarebit, Caesar salad, Oysters Kirkpatrick, and sometimes added to chili con carne, beef stew, hamburgers, and other beef dishes. Worcestershire sauce is also used to flavour cocktails such as a Bloody Mary or Caesar. Known as salsa inglesa (English sauce) in Spanish, it is also an ingredient in Michelada, the Mexican beer cocktail. A fermented fish sauce called garum was a staple of Greco-Roman cuisine and of the Mediterranean economy of the Roman Empire, as the first-century encyclopaedist Pliny the Elder writes in Historia Naturalis and the fourth/fifth-century Roman culinary text Apicius includes garum in its recipes. The use of similar fermented anchovy sauces in Europe can be traced back to the 17th century. The Lea & Perrins brand was commercialised in 1837 and has continued to be the leading global brand of Worcestershire sauce. The origin of the Lea & Perrins recipe is unclear. The packaging originally stated that the sauce came "from the recipe of a nobleman in the county". The company has also claimed that "Lord Marcus Sandys, ex-Governor of Bengal" encountered it while in India under the East India Company in the 1830s, and commissioned the local apothecaries to recreate it. However, author Brian Keogh concluded in his privately published history of the Lea & Perrins firm on the 100th anniversary of the Midland Road plant, that "No Lord Sandys was ever governor of Bengal, or as far as any records show, ever in India." We quote the following history of the well-known Worcester sauce, as given in the World. The label shows it is prepared "from the recipe of a nobleman in the county." The nobleman may be Lord Sandys. Many years ago, Mrs. Grey, author of The Gambler's Wife and other novels, was on a visit at Ombersley Court, when Lady Sandys chanced to remark that she wished she could get some very good curry powder, which elicited from Mrs. Grey that she had in her desk an excellent recipe, which her uncle, Sir Charles, Chief Justice of India, had brought thence, and given her. Lady Sandys said that there were some clever chemists in Worcester, who perhaps might be able to make up the powder. Messrs. Lea and Perrins looked at the recipe, doubted if they could procure all the ingredients, but said they would do their best, and in due time forwarded a packet of the powder. Subsequently the happy thought struck someone in the business that the powder might, in solution, make a good sauce. The profits now amount to thousands of pounds a year. According to historian and Herald for Wales, Major Francis Jones, 1908–93, the introduction of the recipe can be attributed to Captain Henry Lewis Edwardes 1788–1866. Edwardes, originally of Rhyd-y-gors, Carmarthenshire, was a veteran of the Napoleonic wars and held the position of Deputy-Lieutenant of Carmarthenshire. He is believed to have brought the recipe home after travels in India. The article does not say how the recipe found its way to Messrs Lea and Perrins. When the recipe was first mixed at the pharmacy of John Wheeley Lea and William Henry Perrins, the resulting product was so strong that it was considered inedible and the barrel was abandoned in the basement. Looking to make space in the storage area a few years later, the chemists decided to try it again, discovering that the sauce had fermented and mellowed and was now palatable. 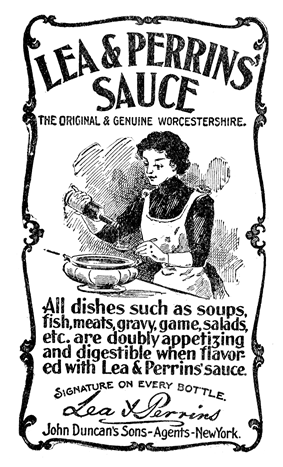 In 1838 the first bottles of "Lea & Perrins Worcestershire sauce" were released to the general public. On 16 October 1897, Lea & Perrins relocated manufacturing of the sauce from their pharmacy to a factory in Aston on Midlands Road where it is still manufactured. The factory produces ready-mixed bottles for domestic distribution and a concentrate for bottling abroad. In 1930, the Lea & Perrins operation was purchased by HP Foods, which was in turn acquired by the Imperial Tobacco Company in 1967. HP was sold to Danone in 1988 and then to Heinz in 2005. Notes from the 1800s were found dumped in a skip in 2009 by company accountant Brian Keogh. The documents are to be placed on display at the Worcester City Art Gallery & Museum. Lea & Perrins declare that their traditional version is gluten-free. Distillation of barley malt into vinegar removes gluten peptides that would harm coeliacs. Many Worcestershire sauces contain anchovies, which is of concern for people with fish allergies and for others who do not wish to eat fish. The Codex Alimentarius recommends that prepared food containing Worcestershire sauce with anchovies include a label warning of fish content although this is not required in most jurisdictions. The US Department of Agriculture has forced the recall of some products with undeclared Worcestershire sauce Several brands sell anchovy-free varieties of Worcestershire sauce, often labelled as vegetarian or vegan. Orthodox Jews refrain from eating fish and meat in the same dish, so cannot use traditional Worcestershire sauce to flavour meat. However, certain brands are certified to contain less than 1/60th of the fish product and can be used with meat. 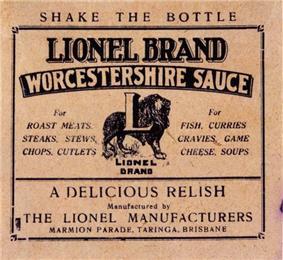 In Australia, there are several manufacturers of Worcestershire sauce, including Holbrooks, Lionel Brand from Taringa in Brisbane, and Crockershire brand made in Harden, NSW. In Brazil, Worcestershire sauce is referred to as molho inglês (literally English sauce). The original Lea & Perrins brand is readily available in shops, supermarkets and restaurants in Brazil but is more expensive than brands made locally, which in general are of surprisingly good quality. In Canada, Lea & Perrins Worcestershire sauce is identical to the standard British version. It is imported from England and has the same bottle. The label is similar to the British version, but modified to include French text. In Denmark, Worcestershire sauce is commonly known as Engelsk Sauce, meaning English sauce. 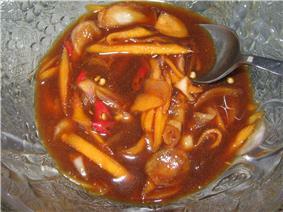 In Indonesia, the name for Worcestershire sauce is kecap inggris meaning "English 'fermented sauce'". In South Africa, Minnies Food Enterprise manufactures Worcester Sauce unders its Minnies brand. In Thailand, the Lea & Perrins Original Worcestershire sauce on sale is, according to its label, imported from England. In Cantonese cuisine and Hong Kong Cuisine, Worcestershire sauce was introduced in the 19th century via Hong Kong and is today used in dim sum items such as steamed beef meatballs and spring rolls. The Cantonese name for this sauce is gip-jap (Chinese: 喼汁; pinyin: jiézhī; Cantonese Yale: gip jāp). It is also used in a variety of Hong Kong-style Chinese and Western dishes. In Shanghai cuisine, the use of Worcestershire sauce spread from European-style restaurants in the 19th and 20th centuries to its use as an ingredient in ubiquitous Eastern European-inspired dishes, such as Shanghai-style borscht, and as a dipping sauce in Western fusion foods, such as Shanghai-style breaded pork cutlets. It is used for Chinese foods such as the shengjian mantou, which are small, pan-fried pork buns. In Shanghai, Worcestershire sauce is called la jiangyou (Chinese: 辣酱油; pinyin: làjiàngyóu; literally: "spicy soy sauce"). As imported Worcestershire sauce became scarce in Shanghai after 1949, a variety of local brands appeared. These are now in turn exported around the world for use in Shanghai-style dishes. Lea & Perrins has in recent years established a plant in Guangdong, China, thus increasing availability of the original variety in China. However, it does not have a dominant market share compared to the native-grown varieties. A thick sauce is manufactured in Japan under brand names such as 'Bulldog', which reflect its English origins, but this is a brown sauce more similar to HP Sauce rather than any type of Worcestershire Sauce. A thicker variety of the sauce, although labelled Worcester (rather than Worcestershire) in katakana, is commonly known as tonkatsu sauce and most often used as a condiment for tonkatsu (fried, breaded pork cutlets). Both the dish and the sauce are thought to have derived from English cuisine imported into Japan in the 19th century. Japanese Worcester sauce (pronounced as Usutā sōsu) is made from purees of fruits and vegetables such as apples and tomatoes, with sugar, salt, spices, starch and caramel. It commonly accompanies western-influenced yōshoku dishes such as the aforementioned tonkatsu and korokke. Yakisoba sauce, and okonomiyaki sauce are also variants of Worcestershire sauce, often thicker and sweeter than the original. An opened bottle of Lea & Perrins Worcestershire sauce as sold in the United States. Lea & Perrins Worcestershire sauce sold in the USA differs from the British recipe. Its ingredients are listed as: vinegar, molasses, sugar, anchovies, water, onions, salt, garlic, tamarind concentrate, cloves, natural flavourings and chili pepper extract. The main difference is the use of distilled white vinegar in place of malt vinegar. 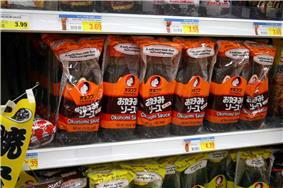 A thicker variety is also sold for the US market. The US version is packaged differently from the British version, coming in a dark bottle with a beige label and wrapped in paper. Lea & Perrins USA claims this practice is a vestige of shipping practices from the 19th century, when the product was imported from England, as a measure of protection for the bottles. The producer also claims that its Worcestershire sauce is the oldest commercially bottled condiment in the US. For years, the US version contained high fructose corn syrup, but sugar was used to replace this ingredient in early 2011. ^ "Rarebit recipe featuring Lea & Perrins", Good Housekeeping magazine (UA), December 1934, retrieved 4 July 2009 . ^ "It's 2009, the 40th Anniversary of 'Canada's Drink': The Caesar". That's the Spirit. Archived from the original on 2013-01-20. ^ Jones, Francis (1987). Historic Carmarthenshire Homes and their Families. Pembrokeshire: Brawdy Books. ^ Shurtleff, W.; Aoyagi, A. 2012. "History of Worcestershire Sauce (1837–2012)." Lafayette, CA: Soyinfo Center. 213 pp. (533 references. 42 photos and illustrations. Free online). ^ a b c Schlesinger, Fay (3 November 2009). "It's out after 170 years, the secret of Worcestershire Sauce... found in a skip". Daily Mail Online. Retrieved 23 June 2010. ^ "Spirit of Enterprise Exhibition – Wine & Sauce Making", Art Gallery & Museum, Worcester City . ^ "Worcestershire Sauce – Gluten Free, Cholesterol Free, Fat Free and Preservative Free". Lea & Perrins. 6 December 2012. Retrieved 27 March 2013. ^ Steinman, HA (August 1996). Hidden' allergens in foods"'". Journal of Allergy and Clinical Immunology 98 (2). ^ Taylor, SL; Kabourek, JL; Hefle, SL (October 2004). "Fish Allergy: Fish and Products Thereof" (PDF). Journal of Food Science (Institute of Food Technologists) 69 (8). Retrieved 14 January 2014. ^ Simpson, AC (6 October 2009). Quick & Easy Vegan Comfort Food. Workman. ^ Cohen, Dovid. "Fish and Meat". Chicago Rabbinical Council. Retrieved 14 January 2014. ^ "Worcestershire", Kosher certification, Star-K, retrieved 4 July 2009 . ^ "Ingredients". Dr Gourmet. Retrieved 27 July 2011. ^ "engelsk sauce". Saucer, krydderier og garniture (in Dansk). Den store danske. ^ a b 会社の沿革 [History of the Company] (in 日本語). Bulldog Sauce. ^ "Western Roots, Japanese Taste: Tonkatsu". ^ About, Lea & Perrins . ^ History, Lea & Perrins . ^ McLaughlin, Katy (6 July 2011). "Sweet Revenge, Chefs Pour on the Sugar". Atkinson, Chef Greg (Jan 28, 2001), "Sauce of Legend", The Seattle Times (NW source) , abetted by Lea & Perrins, reports and debunks the myth, without unveiling Lady Sandys. A very different history of Worcester Sauce, Foods of England .